Before you begin on this list, please be sure you are reading the Bible together with your children every day. This list cannot even hope to replace the benefit of Bible reading for both you and your children. 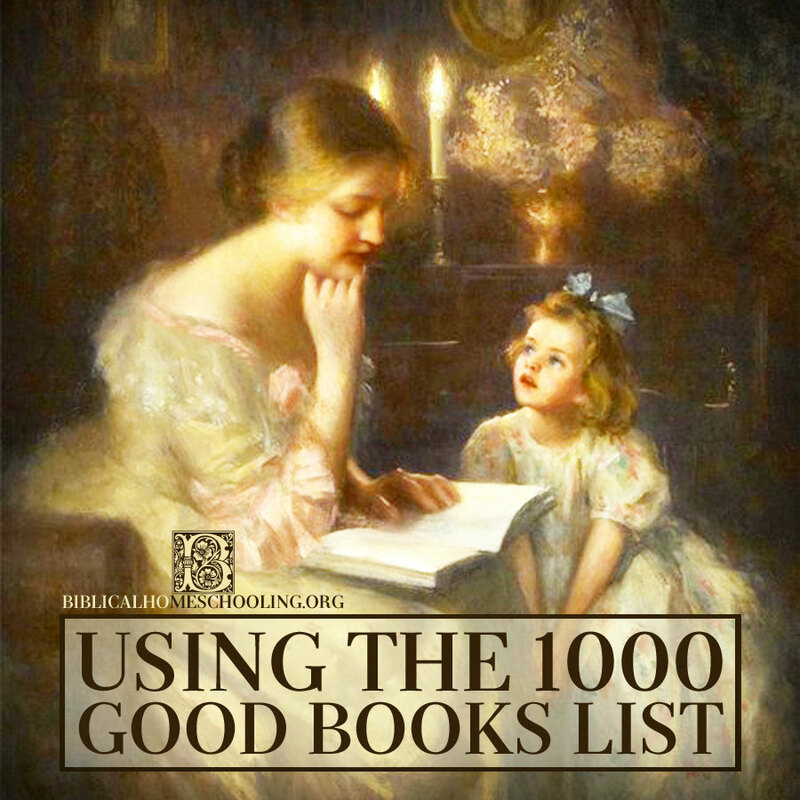 This 1000 Good Books List is by no means exhaustive. Twenty-five homeschooling mothers, discussing criteria in choosing a good book, age and gender considerations, and many other exchanges on individual titles to include or exclude and why, compiled this list. If you know of books that are good that are not included in this list, by all means, do not let their exclusion stop you from reading them with your children. And similarly, if a book is included on this list that you just plain don’t like for whatever reason, then don’t read it. We firmly believe in the parents’ right and responsibility to have the ultimate choice in reading material for their children. We have posted this list as a place to start, not necessarily as a place to end; since many of us did not have the benefit of careful discrimination in our reading material in our own childhoods and education. Does the book have literary value? Does the book emphasize a Biblical worldview or the Judeo- Christian heritage in some way? Does the book teach what is moral or just or true? Does the book encourage love and good works? Does the book exemplify warmth, tenderness, courage, humor, and other values and characteristics to which we desire our children to be exposed? Does the book nourish the intellect and fire the imagination? Does the book cross age barriers to be enjoyed by all? The Bible, the best of the good books and the greatest of the great books, is the backbone of this good books / great books list. The books listed are offered in addition to the Bible, but certainly never in replacement of it. One of the things that makes a good book “good” is its timeless quality, its ability to cross age barriers from preschool children to great- grandparents. Please do not think that simply because a wonderful book like Winnie the Pooh by A. A. Milne, for example, is categorized in 4-6, that it could not be enjoyed by younger and older children. That is the beauty of the truly good and wonderful books. I’ve been looking for a link that you gave me last year on How to Read a Book, but not finding it. Also, I”m looking under the 1000 Good books list for 10th – 12th grade and finding info that talks about the list, but not actually finding the list. Could you point me in the right direction? Thank you so much. As far as filling in the lists and activating the links, I apologize for the delay. Some of you may know that our home was devastated by Hurricane Irma in September of 2017, and since that time I have had to be employed full time outside the home to help with the cost of repairs. As soon as we finish rebuilding the house so that we can live in it again, I can go back to working on this website, and alittleperspective.com, and writing. I am hoping by sometime in the summer of 2018? If anyone feels to led to help or share our Go Fund Me, we have more info about that and our hurricane recovery here: http://www.alittleperspective.com/hurricane-irma-recovery/ Thank you!